This classic Cantonese starter is simple to make, but for real success, there are a couple of rules you need to follow. Most important: always use clean oil for your deep-frying. The resulting batter will be crisp, crunchy and light, as opposed to heavy, greasy and 'dirty' in flavour. And be sure to serve it immediately: this dish is best eaten piping hot. Rinse and dry the squid thoroughly. Slice each squid tube horizontally into 1cm rings. Set aside. In a large bowl, combine both types of flour with the chilli powder, sea salt and Szechuan pepper. Add the squid and toss to coat, shaking off any excess flour. Fill a wok with oil to about a third full (about 500ml) and heat until the surface seems to shimmer slightly. Add half the squid and deep-fry it for between 45 seconds and 1 minute, or until it's just tender and beginning to colour. Remove with a slotted spoon and drain well on kitchen paper. Repeat the process with the remaining squid. 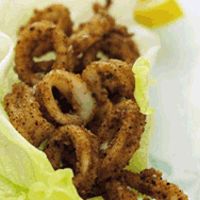 Arrange the lettuce leaves on a platter and top with the squid. Serve with the lemon wedges. Australia's bright, highly focused whites work very well with Asian seafood.